Welcome to the College of Science and Engineering at Hamad Bin Khalifa University (HBKU). The College of Science and Engineering (CSE) aims to be a world-class multidisciplinary college with significant positive impact on Qatar, the region, and globally, in the fields of science, engineering, and technology. To accomplish this, we are advancing knowledge and nurturing technically grounded leaders and innovators through teaching and research across a range of carefully targeted programs. The college aims to serve societal needs, with a focus on an integrated multi-disciplinary curriculum and multi-disciplinary research in science and engineering. Division of Information and Computing Technology: with an emphasis on cyber security, computational science and big data, networking infrastructures, HCI, and visualization and graphics. Division of Sustainable Development: with an emphasis on energy and environment, urbanization, and agriculture & water engineering. Division of Life Sciences: with an emphasis on biomedical engineering, biological sciences, and bioinformatics. 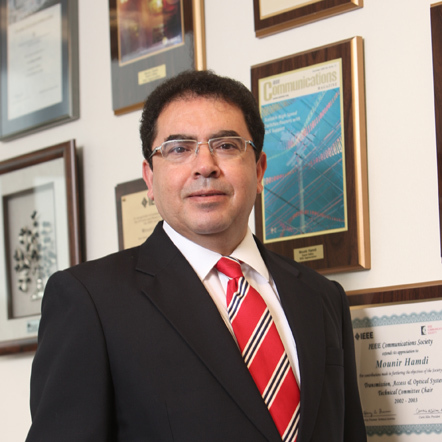 Dr. Mounir Hamdi is the dean of the College of Science and Engineering at Hamad bin Khalifa University. He is an IEEE Fellow, with the fellowship awarded in recognition of his contributions to design and analysis of high-speed packet switching. Before joining HBKU, he was Chair Professor at the Hong Kong University of Science and Technology (HKUST), and the Head of the Department of Computer Science and Engineering. He received a B.S. degree in Electrical Engineering - Computer Engineering minor (with distinction) from the University of Louisiana in 1985, and MS and Ph.D. degrees in Electrical Engineering from the University of Pittsburgh in 1987 and 1991 respectively. He became a founding faculty member in the Department of Computer Science and Engineering at HKUST in 1991. HKUST has been ranked number 1 in Asia by QS world ranking for the past two years, and is ranked third in the world for universities under 50 years old. In 2008, he became the Head and Chair Professor of the department, overseeing around 900 undergraduate and graduate students. Under his headship tenure, his department was ranked 13th in the world by QS World Ranking (2013) and 21st in the world by the Academic Ranking of World Universities (ARWU) in 2013. For 10 years he was the director of the computer engineering program, with around 330 undergraduate students, for three years he was director of the Master of Science in Information Technology program, which has more than 150 graduate students, and he was director of the Computer Engineering Research Lab and the Cyberspace Center. From 1999 to 2000 he held visiting professor positions at Stanford University, USA, and the Swiss Federal Institute of Technology, Lausanne, Switzerland. His general area of research is in high-speed wired/wireless networking and he has published more than 300 research publications on this subject, received numerous research grants, and has graduated more than 40 MS/Ph.D. students. In addition, he has frequently consulted for companies and governmental organizations in the USA, Europe and Asia. He is also a frequent keynote speaker at international conferences and forums on matters related to cutting-edge research and education. Professor Hamdi is/was on the editorial board of various prestigious journals and magazines including IEEE Transactions on Communications, IEEE Communication Magazine, Computer Networks, Wireless Communications and Mobile Computing, and Parallel Computing as well as a guest editor of IEEE Communications Magazine, guest editor-in-chief of two special issues of IEEE Journal on Selected Areas of Communications, and a guest editor of Optical Networks Magazine. He has chaired more than 20 international conferences and workshops including The IEEE International High Performance Switching and Routing Conference, the IEEE GLOBECOM/ICC Optical Networking Workshop, the IEEE ICC High-speed Access Workshop, and the IEEE IPPS HiNets Workshop, and has been on the program committees of more than 200 international conferences and workshops. He was the chair of IEEE Communications Society Technical Committee on Transmissions, Access and Optical Systems, and vice-chair of the Optical Networking Technical Committee, as well as a member of the ComSoc technical activities council. He received the best paper award at the IEEE International Conference on Communications in 2009 and the IEEE International Conference on Information and Networking in 1998. He also supervised the best Ph.D. paper award amongst all universities in Hong Kong. In addition to his commitment to research and professional service, he is also a dedicated teacher and renowned quality-assurance educator. He received the best 10 lecturers award (through university wide student voting for all faculty held once a year) and the distinguished engineering teaching appreciation award from HKUST, as well as various grants targeted towards the improvement of teaching methodologies, delivery and technology. He is frequently involved in higher education quality assurance activities as well as engineering programs accreditation all over the world.